“The Vampire Diaries” Series, on The CW, Bro’s Out. Despite having a name that would appeal more to women, the CW series “The Vampire Diaries,”is surprisingly guy-friendly. The undercurrent of the show is a story of forgiveness, loyalty and brotherly love between Stefan and Damon Salvatore, vampires and brothers. The Salvatore’s team up to defend Stefan’s human girlfriend, Alayna Gilbert, from the constant stream of vampires who want to harm her. Damon will usually rip out one or two vampire hearts in the process. Count 7:3 male to female leads in the surprisingly “bromantic” hit series “Vampire Diaries.” For the picture the female leads are dressed up in red-carpet-gowns but the men dress this fashionably in every episode. The Salvatore brothers are two ridiculously-good-looking-vampires who were human until partway into the American Civil War.Before turning into vampires, the Salvatore brothers fought for the affection of the same vampire woman, Katherine. When Katherine was thought to be trapped in a magically-locked-underground-crypt, the brothers blamed each other for her fate. 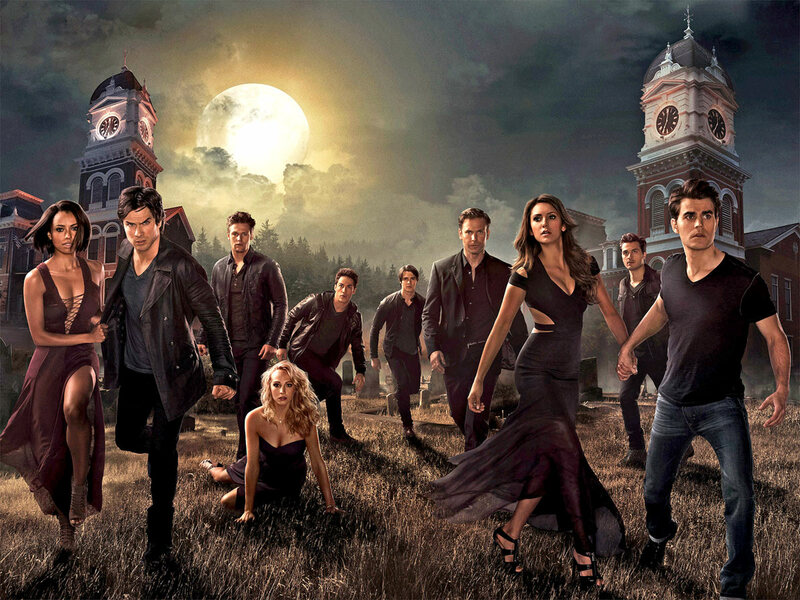 The series should really be called “The Boys Are Back in Town.” One-hundred-fifty-years after the loss of Katherine, the estranged brothers separately return to the Salvatore mansion in Mystic Falls, Virginia. There they meet a teenage girl, Alayna Gilbert, who looks exactly like Katherine, their lost love. Stefan begins to date Alayna, but Damon wants her too. The guys in “The Vampire Diaries,” both human and supernatural, are cool to a fault. Regularly dealing with supernatural villains and the consequences of their scheming, the guys’ talk like Ocean’s 11 casino heist-ers. There is plenty of quick banter and dry humor. Without fail, the guys are all dressed like the coolest guy at the party, donning leather jackets, Henley style T’s, iconic Ray Ban sunglasses, and stylish hair cuts. Damon frequently refers to Stefan’s particularly intricate hairstyle. “I may just have to go get a hero hair-do of my own and steal your thunder,” Damon tells Stefan. The guys in Alayna’s circle of friends get caught up in daily Salvatore-Gilbert drama. We meet Alayna’s childhood-friend turned ex-boyfriend, Matt Donovan and his best friend Tyler Lockwood, a werewolf. We also meet Jeremy Gilbert, Alayna’s stoner- younger brother, and Alaric Saltzman, the new, mysterious and handsome high school history teacher. Damon and Alaric develop a friendship based on their mutual over-consumption of bourbon, and Alaric’s stash of homemade wooden weapons designed to kill vampires who want to harm Alayna. Damon and Alaric work together to keep Alayna and everyone Alayna loves safe. They are the reluctant, stand in father figures for Alayna’s friends, since no one in the show seems to have a father, or a steady parent.